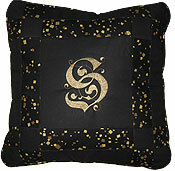 My passion for sewing, quilting and embroidery comes together with these unique and one-of-a-kind pillows. Let's discuss your unique idea? 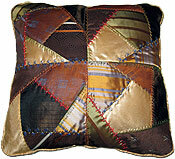 A special pillow can be created from men’s ties in the time-honored quilt patterns of log cabin and crazy quilt. For the person who no longer has a need for ties, this pillow is a great way to make use of the golf theme ties, or the nautical ties, or fishing ties. 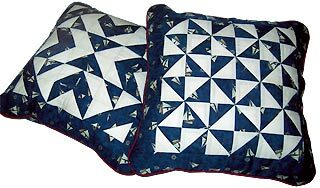 If you would like a memory pillow made from the ties of a deceased family member, 6-8 ties is sufficient to make 2 pillows. Commemorate a special occasion (birthday, graduation or anniversary)and have classmates or family and friends “sign” their best wishes on an autograph pillow. 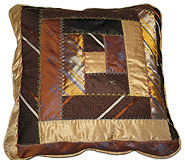 Pillows are pieced with light and dark fabrics in traditional quilt patterns. A permanent fabric pen is included, so autographs can be collected on the light fabric.